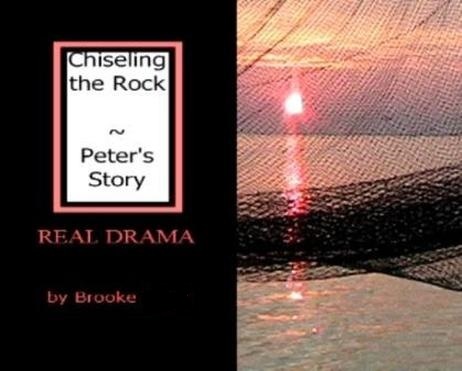 About Peter's Play: Chiseling the Rock - Brooke Brookreson-Williams. Chiseling the Rock is a comedic-laden, fast-paced, realistic drama that shines light upon Peter and Jesus as friends ... as MEN. Easy to follow, and to read, for entertainment. Appealing to both mainstream and religious theatre patrons alike, this play has excellent potential to be far-reaching. Chiseling the Rock follows the chronology of the biblical/historical events closely, and fleshes out the events by keeping the characters human; keeping the characters REAL. You will not find sad-eyed, solemn-stepped, soft-spoken martyrs in this play. But you will find real men with real lives, and real conflicts. Real drama. This online script is for reading entertainment only. There have been several revisions for stage production since this original script was written, and copyrighted with the Library of Congress, in 2005. If you would like to produce this play for your church, community, or school, please contact me (Brooke Brookreson) for a hardcopy of the revised script, and for my generous terms. My gracious appreciation, in advance, for respecting my endeavor and work by contacting me for permission. Thank you.